In this Post, we are going to share one by one tutorial on various topics based on ENGLISH Subject. 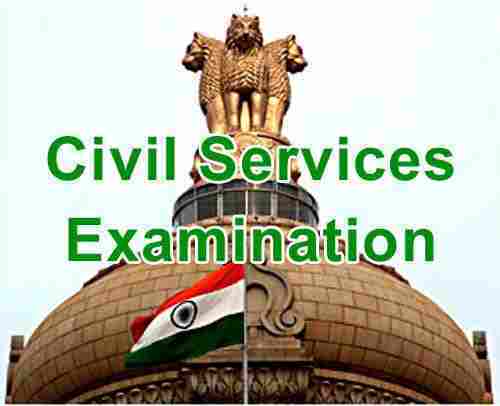 These Topics are very important for Bank, Railways and all competitive exams. We will add the new video here from time to time here on this page. Check this page time to time for complete English Course. Donate if you Like Our Efforts to Help you out in your Preparation. Help Us to grow so that we can share more video like this. Useful Prepositions in English Grammar for competitive exams. A complete List of Prepositional phrases which are commonly used by every one in English Language. In this tutorial we will discuss about use of prepositions in the various sentence. Watch the VIDEO carefully as well as read the complete article to understand the concepts. What is Prepositional Phrases: “A preposition is the kind of word that introduces the so-called invariable prepositional phrase. 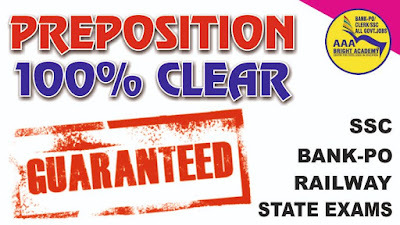 Prepositions usually have the function of introducing attachments, and sometimes ligand binding complements the name or noun phrase that immediately precedes a verb or other names as above. 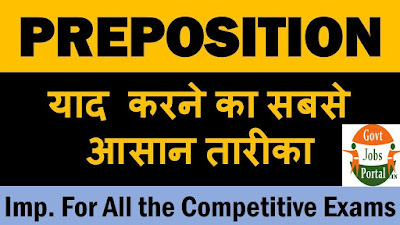 In some languages, prepositions cannot head a prepositional phrase, as in English where they can even appear at the end of the sentence. Traditionally, grammar has been defined as the invariable part of speech that connects words denoting the relationship they have with each other. The use of these prepositions with expressions of place has many layers. Then we will indicate its main uses, although the best way to master its use is undoubtedly through practice. in the bedroom / in my office / in your pocket / in hospital / in prison / in bed. in the front / in the back of a car (but, at the front / at the back of a cinema, of a building). on the table / on the wall / on the floor / on my shoulder / on page 103 / on the second floor. It is very hot, isn’t it? She sings well, doesn’t she? Or if you want to put in another way you can say, She sings well, doesn’t she? Generally the trend is that in case of informal sentences the negative form is written in short which means instead of writing is not it we tend to write isn’t it. But this style of contraction can be used only in case of informal writings but in case of formal writings we should use the full form like, They said they would finish the work in six months, did they not? If we had to write this same sentence in an informal tone we would have written it in the form: They said they would finish the work in six months, didn’t they? The main purpose of using question tags is to find whether something which is said is true or not. The tags are also used to get some kind of agreement against the statement or in favor of the sentence. The thumb rule of the use of question tags is that you use negation after an affirmative sentence and vice versa. 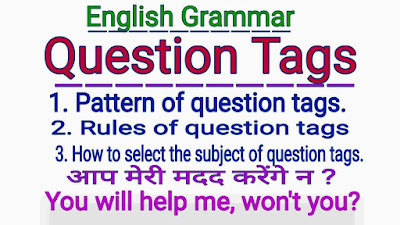 And at the same time please remember that question tags are always used in case of negative and affirmative sentences and they are not used after questions. In case of affirmative sentences we are supposed to use negative tags. 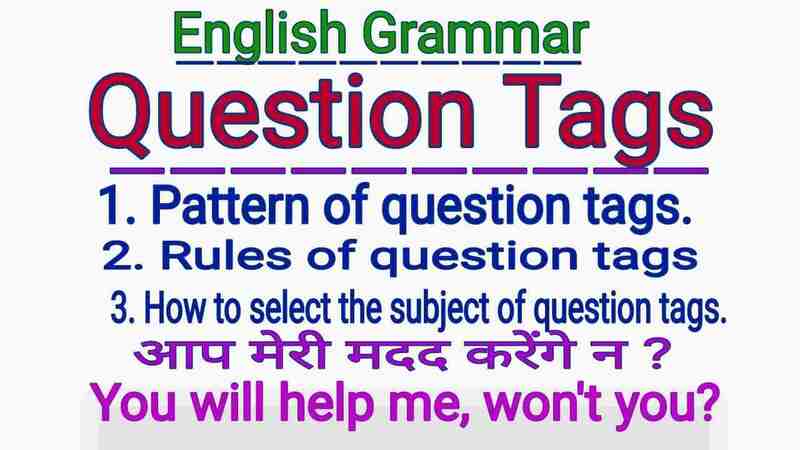 Another Question Tags rule which you need to keep in mind is that if the main sentence has an auxiliary verb you are supposed to use the auxiliary in the question tag also. They are busy, aren’t they? She is going, isn’t she? They haven’t arrived, have they? On the other hand if the main sentence does not have an auxiliary verb in that case the tag takes the various forms of the verb “do”. You love fish, don’t you? She came today, didn’t she? 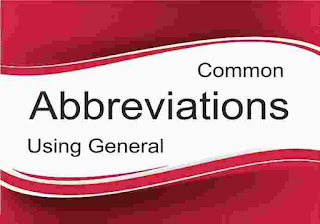 This article is all about IMPORTANT Abbreviations or Short Form Words. Abbreviations are extremely important to learn. You need to use abbreviations in your daily communication models. However, it is also important to update yourself with respect to abbreviations used across the globe. Most abbreviations play a major role in booking, cancelling flight tickets, understanding and decoding codes. If you are well aware about abbreviations, half the job is complete. 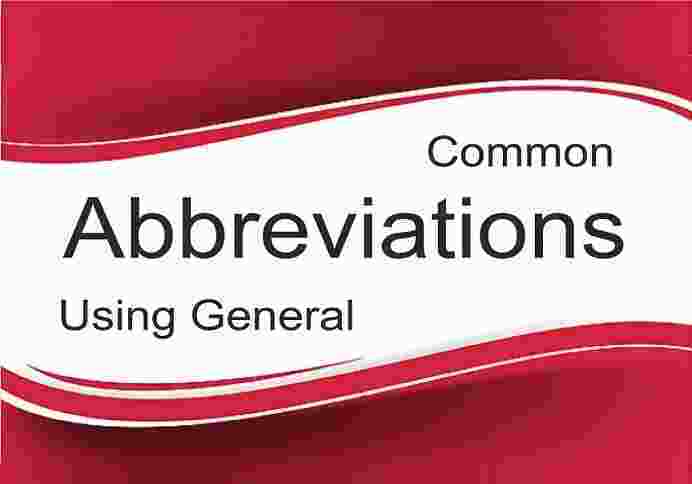 So in this article we are going to share the List of 45 Most Important Abbreviations which really help you in your life. So learn these Short Form words to make your life little a bit easy. Am I eligible for teaching job after BTech? Question:1.I am a final year student of BTech from Phagwara. I want to go into teaching. I have heard that BTech students can give the NET to become a lecturer? Answer. The CSIR-UGC NET Exam for JRF & Lectureship is conducted by the CSIR in five areas: Chemical Sciences, Earth, Atmospheric, Ocean & Planetary Sciences, Life Sciences, Mathematical Sciences, Physical Sciences. Yes, BS-4 years/ BE/BTech/ B.Pharma graduates are eligible to take the NET, apart from those with an MSc or equivalent degree/BS-MS/MBBS with minimum 55 per cent marks (5 per cent relaxation in marks for SC/ST/ OBC/ PwD). In case you wish to take the CSIR-UGC NET Exam to be held on December 16, 2018, you can apply under the “Results Awaited” (RA) category – provided you complete your degree within two years in order to avail of the Fellowship (JRF). However, if you only possess a Bachelor’s degree (BE/BTech/BPharma), you’re not eligible for lectureship. Incidentally, the IITs offer direct admission to PhD for meritorious BE/BTech students (1st divisioners). But, as per current UGC norms, these PhD degree-holders are not eligible for the post of Assistant Professors in Indian universities although they’re qualified for the post at the IITs/NITs. Reason? They don’t possess the mandatory master’s degree. This anomaly was finally addressed by the UGC in its recent meeting and is likely to be scrapped/amended. Incidentally, BSc (Hons) or equivalent degree-holders who are enrolled in Integrated MS-PhD programmes (with minimum 55% marks) can also apply. The age limit is 28 years for JRF (NET). There’s a 5-year relaxation in age limit for SC/ST/ /PwD/Women candidates and 3 yrs for OBC (creamy layer). The application deadline is October 15, 2018. Data science course from govt agency? Question:2. I have been working as a software developer in a small IT firm in Noida for the past five years after doing my MCA. I have been reading about Data Science and am very keen to learn something about it. But it is not possible for me to leave my job as I have family responsibilities. Nor can I spend a huge amount on fancy courses. What do you suggest? Answer. For starters, if you can spare four (two-day) weekends, there’s an interesting Skill Development programme on Data Science & Machine Learning offered by the M/o Micro, Small & Medium Enterprises (MSME), Govt. of India, that you could check out. The technology Development Centre of MSME, Meerut would be your best bet. If you hurry, you could enroll for their first session which starts on October 6, in NOIDA (Sect 3) itself. Being a government initiative, the fee has been kept at Rs.25,000 (+GST). For details, log onto: www.ppdcmeerut.com . There are several other courses in the market, including some good online ones that are offered via the MOOCS platform which you could check out. In fact, data scientists and front-end developers received the maximum salary hikes in 2017. Those with three to five years of experience fetched salaries ranging from Rs.25-29 lakh last year. Data scientists use computing systems to collect, analyse and interpret large quantities of data and information to help businesses (including startups) improve their operations and gain a competitive edge over their rivals. And in the wake of the AI (Artificial Intelligence) boom, many companies are looking to grow their Data Analytics teams. Hello students as you all know SBI has released the official notification for SBI PO recruitment 2018 and exam dates of SBI PO 2018 are already out and you all must have already started your preparations for the SBI PO Examination 2018. 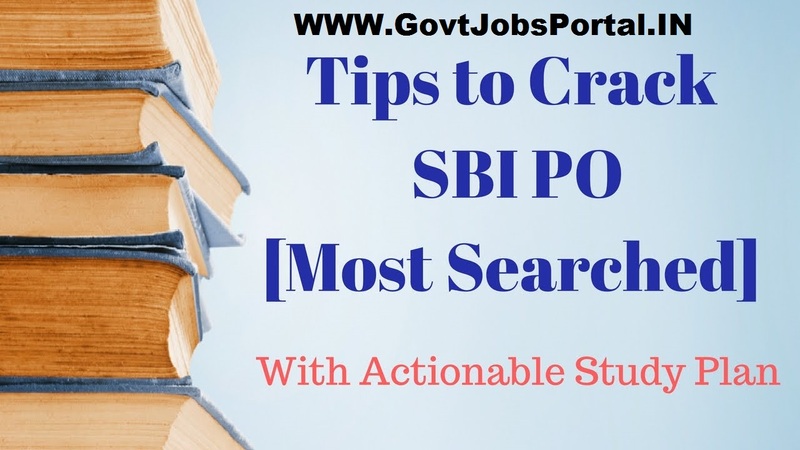 As the preliminary examination of SBI PO 2018 is going to take place in July so it is the crucial time to put your all efforts to crack this exam as the competition is going to be really hard-hitting. Candidates you still have two months for the preparations so don’t lose your hope; have a positive attitude and work hard to hit your goals. For helping you out in this crucial time we are providing you a study plan which is a weekly based study plan and is going to help you in scheduling and managing your time. As in any exam there are different requirements for the different sections because there are some topics which require more time and some topics are those which want less time so we have to plan our time table according to these topics. As we have not extra time to waste on the unnecessary things so it’s better to well plan your schedule and study according to this. So in this article we are providing you a study plan which is a weekly based study plan and this will help you in dividing your topics weekly wise and to prepare them according to the time they required. So you have no need to look here and there just do not waste your time, adhere to the study plan and you will surely be able to achieve your goals. This plan is prepared as a result of analysis of SBI PO 2016 and 2017 examinations. As you all have prepared according to the study plan, now it is the time for evaluation. Self evaluation is very important; if you will self evaluate yourself then only you will come to know your weak as well the strong points. Last 10 to 15 days are very crucial, in this period you should evaluate yourself by solving the previous year question papers and give a final touch to every topic, because if you will not give a review to the learnt topics then they will be washed away because most of the topics which you have not given a review fades away with the time. So it is good to give a fresh look to every topic and work on your weak points and strengthen your strong points. In these crucial days just go through the SWOT Analysis. SWOT stands for (Strength, Weaknesses, Opportunities, and Threats). This will help you in building your self confidence which is a key to get the success in any field. Let us explain this strategy in brief. S stands for Strengths: go through the topics and evaluate yourself that in which topics you have a strong hand and prepare them well and make them an instrument for the fight. Learn these topics on your fingers so that you can attempt such type of questions in the exam with full accuracy. In simple words you can say just work on your strengths. W stands for Weaknesses: work on the topics, in which you are weak, practice them more frequently and try to improve your command on these topics. O stands for Opportunities: utilize the opportunities at a right time, this means that the topics in which you have a strong hand try to attempt those in the exam with more accuracy and in less time. This will help in saving your time for the other questions. T stands for Threats: this means to say that stay away from the threats such as the negative marking threat. Focus on the quality of the answered questions not on the quantity. Try to attempt the maximum questions with accuracy. Leave the questions in which you have any doubt. Attempting the doubtful questions can ruin your dream of becoming a banker. Use these all strategies to achieve your goals. Best of luck students!!! The Students who are seeking for government jobs, bank and SSC exams are the golden opportunities for them, so students get ready for these exams, work hard and grab this golden opportunity by cracking. Most of the students are preparing for both these exams to have a government job, as you are having lack of time so in this article we are providing you some key points by following these you can prepare for Bank and SSC exams together. The important thing about these both exams is that they are having some similarities in the syllabus of these both exams. If you want to prepare for both of these exams together then you can go with the similar syllabus of these exams first and then go through the different syllabus later on. QUANTITATIVE APTITUDE is one of those similar syllabuses for these SSC and Bank exams. If you want to prepare for these exams together then we advise you to prepare the quantitative aptitude together, although there are many differences in the syllabus of the QUANTITATIVE aptitude of these two exams but you can’t ignore the similarities also. We will also explain in this article that what are the differences between the syllabus of QUANTITATIVE APPTITUDE of these two exams. You can go through the similar syllabus first and the different syllabus later on. The main difference between the BANK and SSC quantitative aptitude is that of Advanced Mathematics. You need to have a conceptual and thorough knowledge of Advanced Mathematics in SSC whereas it is not needed in the BANK exams.